Eating right, practicing good hygiene, and making healthy life choices is the preferred way to keep teeth healthy and whole, but when someone is at high risk of developing decay, sealants may be a good option. And when they are recommended, you want to be sure that the material used is biocompatible. Many sealants aren’t, containing ingredients such as fluoride, a neurotoxin. Yet research suggests that this doesn’t necessarily make them more effective than fluoride-free sealants. 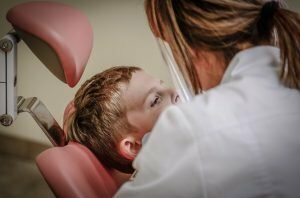 The study, published last summer in Caries Research, compared the effectiveness of two types of resin-based sealants in children at high risk of tooth decay. One resin contained fluoride; the other was fluoride-free. Two randomizations were done. In the first, molars were randomized among the sealant group and the control group. In the second, the type of sealant was randomized. After two years, 483 tooth pairs were assessed. Sealed molars were found to have an 83% less risk of developing serious cavities than non-sealed molars, though the effect was less on molars showing early signs of decay. The effect of the sealant was similar regardless of whether it contained fluoride or not. That being the case, why would anyone opt for fluoride, which, as our friends at the Fluoride Action Network note, “is, in terms of acute toxicity…more toxic than lead, but slightly less toxic than arsenic”? Why not choose the nontoxic option instead? In our office, when we use resins – whether for sealants or composite (tooth colored) fillings or restorations – we opt for materials that are both fluoride-free and BPA-free. Knowing what we know about these common ingredients, we feel it’s just the right thing to do. And if you or your child has already had sealants placed that contain these ingredients? It can actually be far more damaging to the long-term health of the teeth to remove sealants than to simply keep them in place. Instead, consider steps you can take to detox and limit future exposure to these toxins – including finding a new dental home where biocompatibility is a guiding rule of care.